Shatterproof plastic craft beer tasting glasses let you enjoy a brew to its fullest taste potential without worrying about breaking your glass. Each four pack of cups is made for a specific beer (like IPA, stout, or sour) and is designed to help enhance its aroma and flavor. The BPA-free cups stack up for easy transport and can go through the dishwasher, too. Great plastic cups for outside fun. Gave these for Christmas and the man loved them and said he was going to use them in his spa. Safe for outdoors and attractive too! Bought these as a gift for beer drinking friends. They love them for use on their boat—they fit into cup holders and won’t break! B Cups plastic craft beer tasting glasses come from beer-loving brothers Joel and Justin Bigham. The idea to make a shatterproof version of their favorite beer glasses popped up when prepping for a vacation together. IPAs were on the packing list; fragile glassware was not. The brothers created cups that let you enjoy craft beer the right way without any don’t-break-it!-worry. The cups are made for specific beers—like the Bigham’s beloved IPAs—and are designed to mimic traditional glassware that complements each brew. So a stout, sour, or lager will taste exactly as it should. 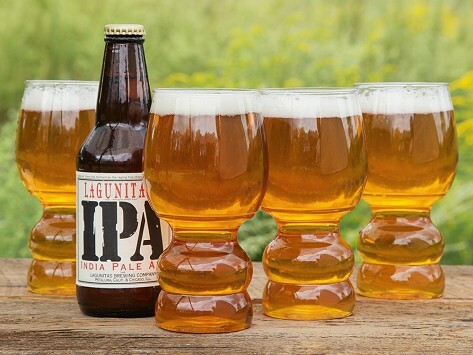 Ridges at the base of the cups help aerate the beer, opening up flavor and aroma. The close-to-unbreakable cups are stackable, dishwasher safe, and come in packs of four so you and your beer-drinking besties can all enjoy a worry-free craft beer experience just about anywhere.